Is an Ad Campaign the Solution or the Problem? | KMA and Co.
Is an Ad Campaign the Solution or the Problem? The campaign was rolled out amid puzzled looks from biopharmaceutical executives who couldn’t understand why an industry devoted to curing diseases and decreasing human suffering should need an image campaign. But facts don’t lie. Within a month of the launch of the campaign, Fortune published their 2017 list of the most admired companies in America, and Johnson & Johnson was the only pharmaceutical company to make it into the top 50 taking the 13th spot on the list. But that wasn’t always the case. In the early years of the list, pharma companies regularly appeared in the top ten most admired companies. In 1991, Fortune noted that Merck, which took top honors that year, was the only company that had made the top ten for the life of the survey. The article reporting the survey results in 1991 credited Merck’s “consistent sales and earnings growth, fueled by blockbuster products… [and] the company’s commitment to research and development,” which the magazine described as “huge… [the] kind of money that attracts the brightest minds in the business.” Johnson & Johnson and Eli Lilly joined Merck in the top tenth of the list that year. So what is responsible for the sector’s fall from grace? These days, concerns about high drug prices come to mind along with the antics of some bad actors such as Martin Shkreli. But reputations are made and lost over years or decades, not the 18 months since the pricing scandals first hit the headlines. I saw a “Go Boldly” ad today on CNN, running along side to a direct-to-consumer (DTC) pharmaceutical ad. And I wondered why no one ever considers the relationship between the introduction of DTC advertising in the late 1990’s and the decline of the industry’s reputation? Direct to consumer advertising has been considered a boon to drug industry sales, estimated to return more than $4 in sales for every dollar spent. Drug makers must see value in the practice; It is reported that in 2015, drug makers spent $5 billion on advertising, up from $791 million in 1999. And what happened to the industry’s ranking in Fortune during that time? By 1997, Merck dropped from first place to third. The following year, Johnson & Johnson was ranked 9th and Merck had fallen to 10th place. By 1999, there were no drug companies among the top ten most admired companies. That year Johnson & Johnson was ranked 13th. Coincidence is not causality, but I’m surprised the DTC ads are never mentioned as contributing to the industry’s reputation problems. After all, before DTC advertising Pfizer was known as the company that invented (or at least commercialized) penicillin. Now it’s known as the company that helps old men get erections. 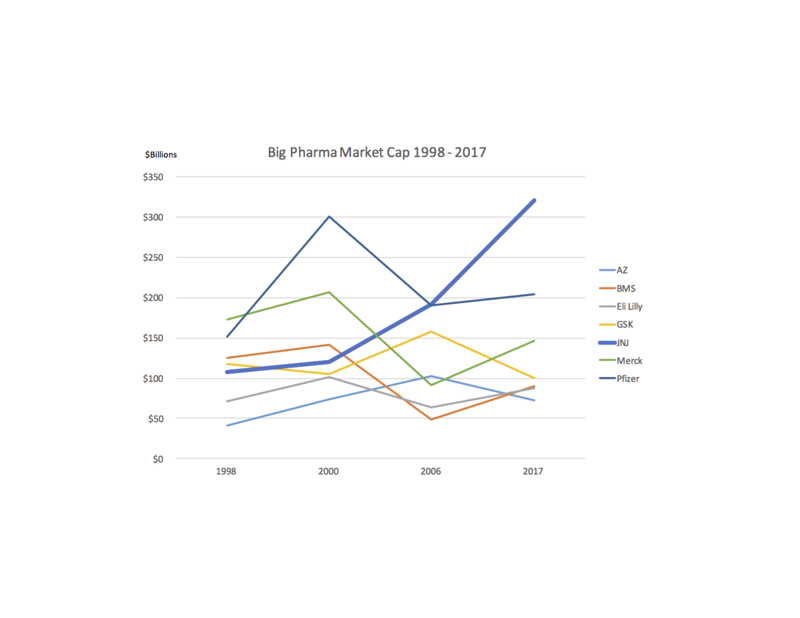 While there’s no reliable way to calculate goodwill except in the case of an acquisition, for the fun of it I looked at the market caps of several Big Pharma companies going back to the late ‘90s. I used December 1998 as a baseline since the FDA issued its final Guidance for Industry on Consumer-Directed Broadcast Advertisements in 1999. As the chart shows, all but two companies have lower market caps today than they had at the end of 1998. And, five of the six are also off the peak market capitalization. 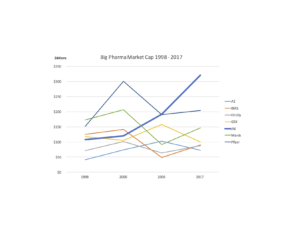 Merck, Pfizer and Eli Lilly all saw their market caps peak in 2000, the year after the DTC advertising rules took full effect. The market caps for GSK and Astra Zeneca both topped out in the second half of 2006. In contrast, Johnson & Johnson’s market cap is currently at an all time high. It is also the only pharmaceutical company that made the Top 50 Most Admired list in 2017. JNJ also has a history of taking a conservative approach to DTC advertising, particularly when its CEO, William Weldon, took over the leadership of PhRMA in 2005 encouraging the group’s members to include more risk-related information in their DTC advertising. While hardly an exhaustive analysis, it’s at least worth noting that the rise of DTC advertising may have had an impact on the reputation and valuation of Big Pharma companies. Instead of looking to an ad campaign as a cure for what ails biopharmaceutical companies, perhaps PhRMA should look at advertising as a contributing factor to its reputational problems.